Petit fours from the Watergate Pastry Shop: triangles of dark chocolate cake, buttercream, marzipan, apricot preserves and pastry nestled in tissue in a cardboard box. Coffee ice cream studded with m&m’s, melting in a waffle cone in the Steve’s parking lot on Cape Cod. Ticking hood of a car warm against my legs, the air cooling in the twilight. Apple turnovers full of fluffy, whipped cream at the Picadilly Market in London, fall trimester junior year of college. I ate them in the street in my black wool skirt and boots. The Carvel ice cream Cookie Puss. The full inventory could probably be a book in itself. Maybe a series. As I compiled it, I thought for the millionth time how interesting it is that memory is yoked to our senses: sounds and smells, textures and flavors. How memory is like writing in the way you attach to something small, a detail, a flavor or texture and then the whole blooms from that part. I’m curious, too, about the word sweet itself and how we equate sweetness on the tongue with a kind demeanor—as in she’s a sweetheart. I’m wondering if there are similar equivalencies in other languages. If anyone knows whether the word for sweetness in another language translates to a gentleness of character or beloved one, please let me know! July 18th I’ll perform an excerpt of “Sweet Tooth” as part of a solo show called Food for Thought. I look forward to spending some time with the indomitable Tekki Lomnicki, artistic director of Tellin’ Tales Theatre, which is producing the show at Prop. If the weather’s acting like it ought to in July, we can sip post-show cocktails in the garden at Chief O’Neill’s across the street. Get your tickets here. I’m headed there in July. On the way, while waiting for planes and ferries, I’ll work on the last essay in the collection, “Following Sharks.” It’s about how we survive after trauma or loss, how suffering can linger and the ways we let it go. There have been reports the last few summers of increasing numbers of great white sharks off the Vineyard because of the resurgence of gray seals in the area. And while that does give me pause—I grew up in the age of Jaws—I recently found another, more soothing way to consider sharks in the form of a website that tracks their migration patterns. Katharine, Mary Lee, Poseidon, Miguel and seventy-nine others (there’s even an Oprah) have been tagged with transmitters that let researchers know their whereabouts every time their dorsal fin breaks the surface of the sea. 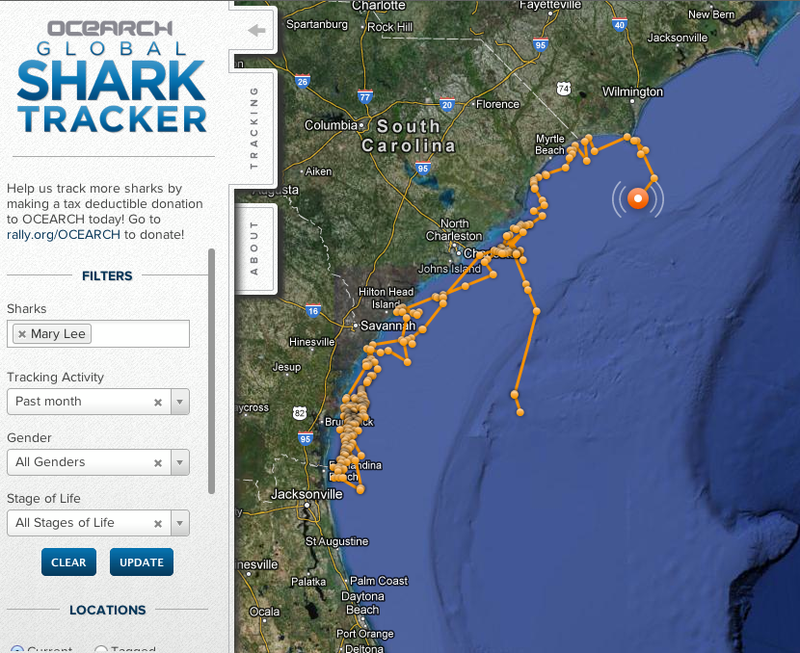 Some of the sharks have these crazy trajectories and no one knows what they’re up to, what drives them to swim where they swim. Recently, when I was having a rough day, I found myself thinking about the Ocearch sharks. I felt myself relax, contemplating their mysterious peregrinations. It helped put things in perspective.It’s bracing to think about how much we don’t know, how much bigger the picture is than what we see at any given moment. Also there will be salt air and rose hips and good things to eat and running on those little roads and seashells and Flying Horses Carousel and the ocean. 4. Stand up paddle boarding. I tried it last summer and LOVED it. I will go in Lake Michigan which is currently shark free. 6. Summer reading—outdoors! Beach, sidewalk café, park. Maybe a little hammock action. In addition to the books I mentioned in my last post, I’m finishing books four and five in George R.R. Martin’s Song of Fire and Ice. I started the series this spring because the Game of Thrones ballyhoo finally piqued my curiosity, but I’m too scared to watch the show. It’s kind of a bloodbath, yes? But now I know who everyone is and what’s happening in the kingdom. I took an online quiz (actually a couple of them) to see which character I am. I got Daenerys first and then Tyrion. I was kind of hoping for Jon Snow or Arya, but at least I didn’t get Cersei or Joffrey, am I right? Did you know you can learn to speak Dothraki? 7. I am in The Best American Nonrequired Reading anthology for 2014! Technically, this is happening in the fall (October 7th to be precise), but it might be the most exciting thing on the list (up there with blueberries). Earlier this year, I found out that “The Saltwater Twin” is going to be included in this super cool anthology. 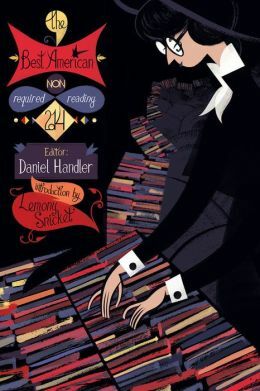 The editor this year is Daniel Handler, aka Lemony Snicket. Last year’s anthology included writing by Sherman Alexie, Lynda Barry, Walter Mosley and Kurt Vonnegut, so I’m feeling pretty fancy, friends. Now let us all go forth and get summery! How could I have forgotten Cookie Puss? Hats off to you for getting selected for The Best American Nonrequired Reading! I associate the book with winter because I always get a copy for Christmas. Such a great book filled with stories by great authors. And now you are one of them. I will especially enjoy reading this year’s version. In keeping with the theme of your post, I’ll raise a tall glass of ice cold lemonade to your achievement. Congrats! Love so much of this, causing me big grins on the bus amidst so many short shorts & tube tops (but no blueberries I can see). To summer! Excited to read your piece in the fancy anthology. And to know that Lemony Snicket is aware of your existence must be a thrill! Love your energy, your adventuresome spirit and your tenacity!